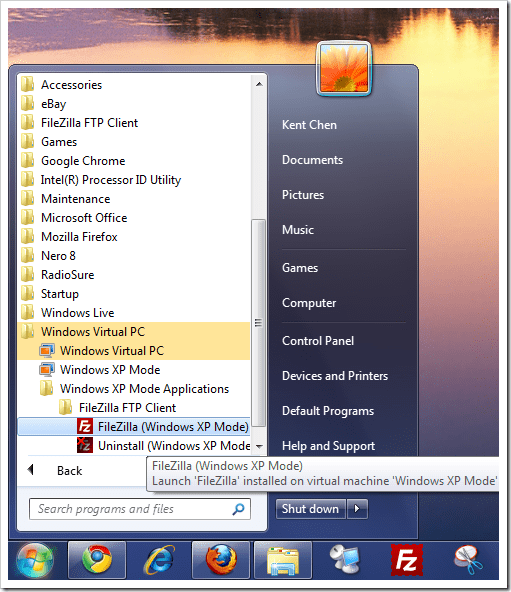 One another major feature that aims to smoothly solve compatibility issue in Windows 7 is Windows XP mode, which basically runs applications that don’t naturally work in Windows 7 in Virtual XP on top of Windows 7. Sounds like a hassle, but let’s see how exactly it works. 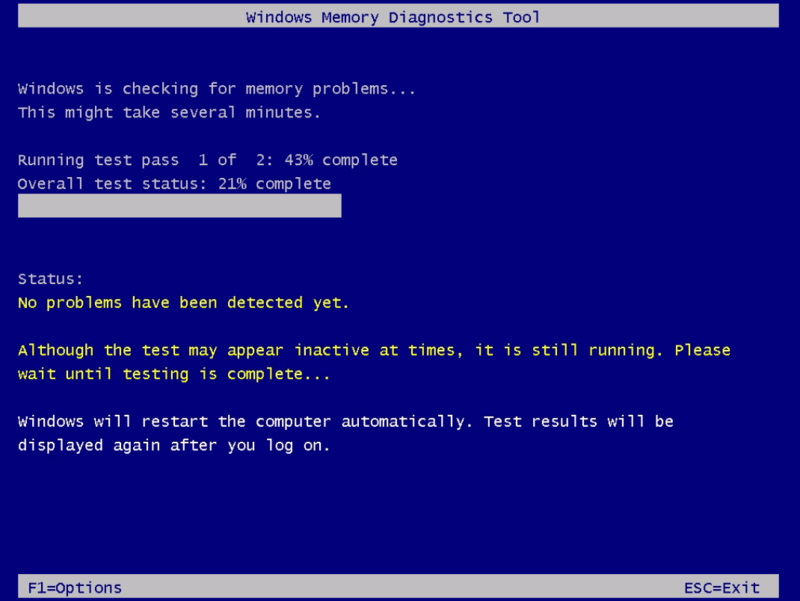 It requires a virtualization engine, such as Windows Virtual PC. It requires a CPU processor with Intel Virtualization Technology or AMD-V feature turned on. If your computer doesn’t meet any one of these, stop here and get a computer that meets all these requirements before moving on. Even though it’s a new nice feature in Windows 7, in order to use it you need to download Windows Virtual PC (current in RC as Microsoft Update Standalone package format) and Windows XP Mode (in self-extract cab format) from this Microsoft download page first. The XP mode virtual image is about 470M big, so it may take a little bit time to download. 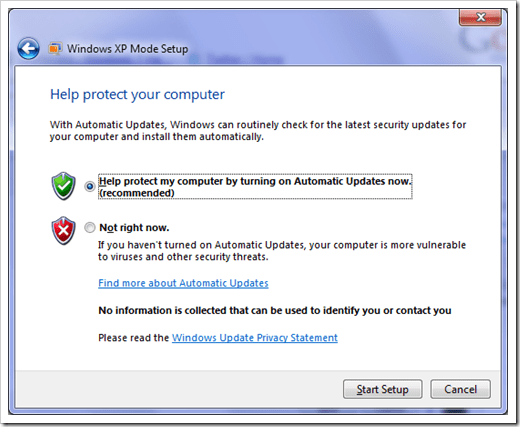 First, uninstall any of previous version of Windows Virtual PC from your computer. 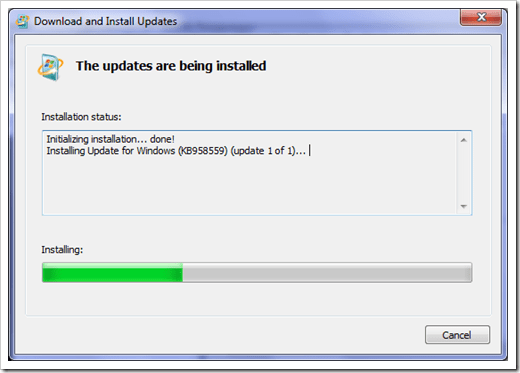 Second, install new downloaded Windows Virtual PC. Once it’s finished, restart your computer, and move on. 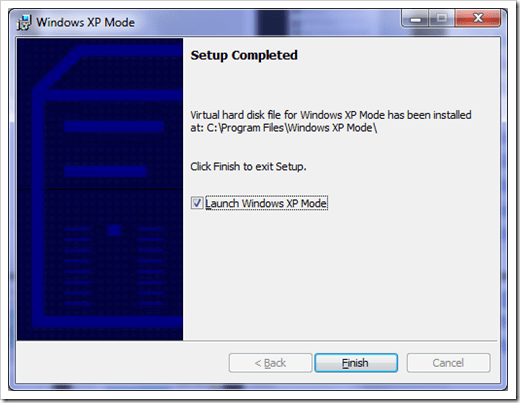 Lastly, install Windows XP Mode by simply double-clicking the downloaded self-extracted cab file. You will need to go through a simple wizard when you first launch the Windows XP mode. 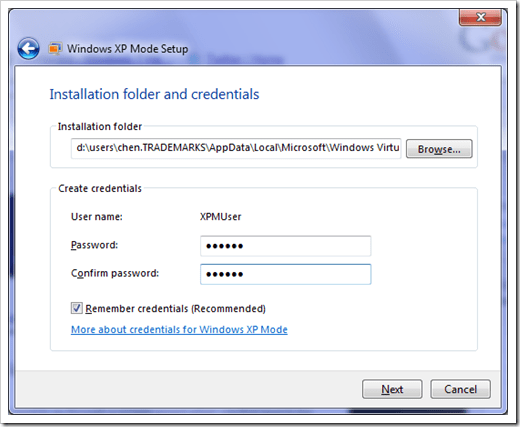 First, prove a password to the pre-defined username xpmuser. 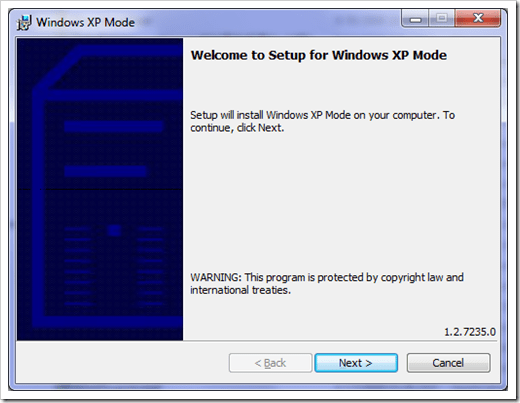 Next, a familiar window you saw every time when you set up a new Windows XP machine. Once the green bar goes all the way to the right, you are ready. Assuming the awesome free FTP client tool FileZilla doesn’t work well in Windows 7, so let’s see if it does well in XP mode. Note that it’s just an example in this post. 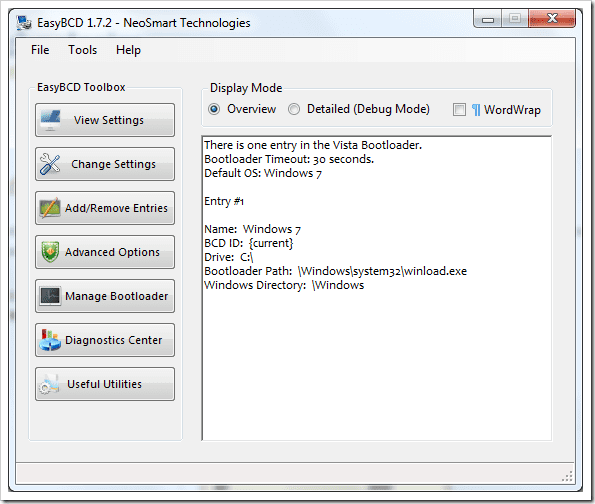 In reality, it works extremely well in Windows 7. 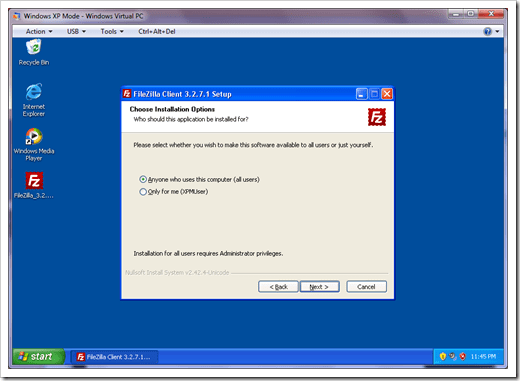 First, install FileZilla onto XP Mode machine. Make sure to select Anyone who uses this computer (all user) option during the installation. 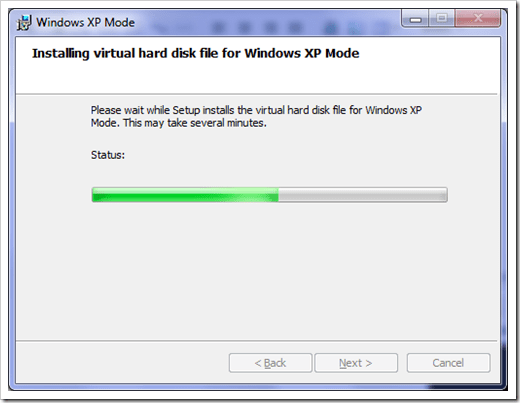 Once the installation is finished, shutdown the XP virtual machine by clicking Action | Close from the top toolbar, which will put the machine in hibernation mode. 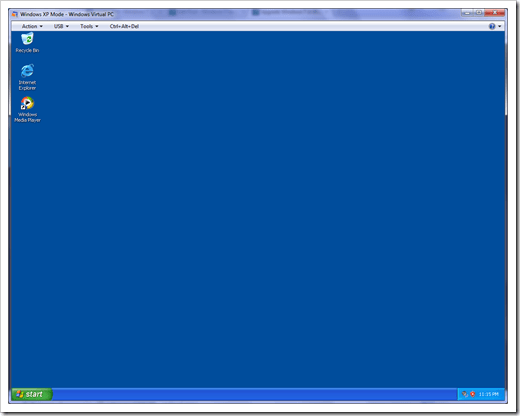 And here is what it looks like in XP mode, so seamlessly. 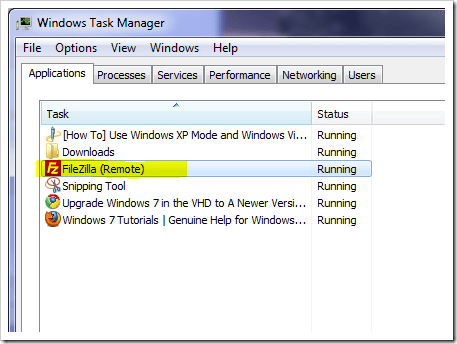 You won’t notice unless you take close look at Windows Task Manager, in which it shows FileZilla running on remote. Amazed yet? you probably can’t wait to give it a try now. Enjoy. Can I make my own XP-Mode? 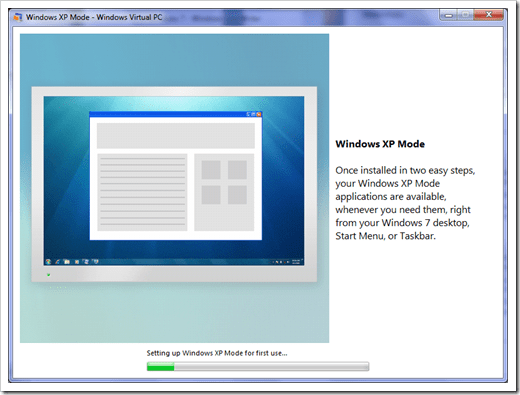 So you have one XP virtual machine already setup and running on your Virtual PC, you may ask if you can make that machine to your own XP-Mode without downloading the XP-Mode-ready image from Microsoft. Sure enough, you can. Simply follow this post and you will be able to do so. Hmm…could the downloaded file corrupted? Did you download the file right from MS download website?